In retrospect, the National probably shouldn't have tried to start recording their sixth album on the night Hurricane Sandy hit New York. 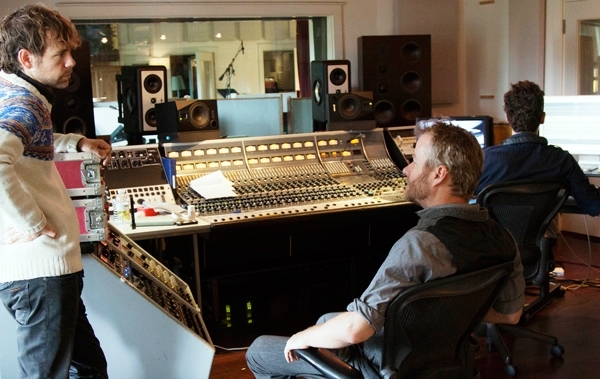 The band had just settled into the Clubhouse studio – where it planned to live and work for the next few months – when singer Matt Berninger glanced out the window and saw a tree crash to the ground. Suddenly, the power went out – leaving everyone no choice but to ride out the storm in the dark. "Everything went black for a few days," he says. "We're not a band that sits around with acoustic guitars and jams with a bottle of wine. So it was kind of comical for us." But after that rocky start, Trouble Will Find Me (due out May 21st) came together easily. When the National began writing new material in the fall of 2011, they were riding high off 2010's breakthrough LP, High Violet – their best seller, which sold an impressive 300,000 copies. "When we started, we weren't exactly a cool band like the Strokes or Interpol," says Berninger. "For years, we tried to prove we weren't boring white guys. This time around, we didn't have to prove anything. We thought, 'Let's not worry if a song is cool or edgy.'" While touring behind High Violet, Berninger had become obsessed with Roy Orbison – an influence you can hear clearly on the new record's lush "Heavenfaced." "He would write pop songs, but they were long and have all different sections," says Berninger, who was able to hit Orbison-style high notes after he quit smoking. Guitarist Bryce Dessner cites Simon and Garfunkel and Bob Dylan as other key inspirations. "That's the music we grew up on and listened to," he says. "So we accessed some of that classic songwriting." At the same time, the band wanted to push itself in new directions, which led to songs like the synth-driven "Demons," which Berninger describes as "a fun song about embracing your dark side." Berninger also gets more sentimental than usual in "I Need My Girl." "In the past, that would have been an underhanded metaphor," he says. Up next: The National will launch a major tour later this spring (including a stop at Brooklyn's Barclays Center arena). They also appear in Mistaken for Strangers, a documentary directed by Berninger's younger brother, Tom. The movie centers on Tom's experience as a roadie – and the elder Berninger says shooting the movie helped take the pressure off making the record. "My brother and I were fighting, so I didn't have any energy left," says the singer. "The record became a respite from the stress of making a movie."